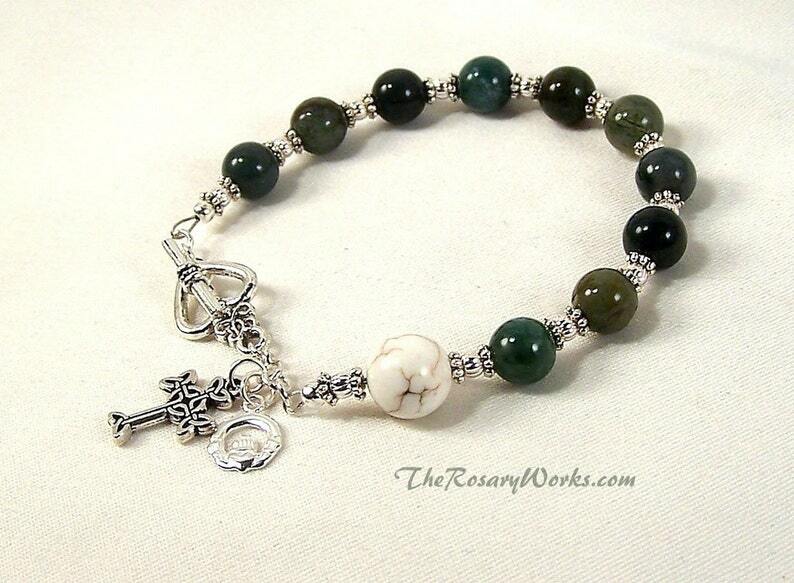 The Aves in this striking Irish rosary bracelet are 8mm fancy agate in varying shades of green The Pater bead is a 10mm white magnesite bead. The Claddagh symbol is sterling silver. The Celtic Cross is fine silver plated onto lead free pewter. The clasp and spacers are silver colored metal. The photo shows this bracelet with a Claddagh symbol and a Celtic cross. However, if you would like a different medal or crucifix instead of the medal and/or crucifix in the photo, please choose from one of the options to the right. Please note that all the options offered are not shown in the photo. This bracelet will fit a 7 1/8 to 7 1/4 inch wrist. This bracelet can be made longer or shorter by 1/4 inch. If you would like it shorter than 1/4 inch, please contact me for a custom order. Unfortunately, this bracelet can not be made more than 1/4 inch longer. If you would like it to be shorter than 1/4 please contact me for a custom order. Free shipping includes a pretty hand stamped jewelry gift box, delivery confirmation and insurance on USPS First Class Mail. Thank you for taking a minute to view my handmade rosary bracelets and prayer beads designed to enrich your rosary prayer. God bless.